You are here: Home | Cancer Prevention | Wheatgrass, Does natures’ super nutrient have the power to turn grey hairs back to their original colour? Studies over the years have presented many benefits of consuming wheatgrass on a daily basis. 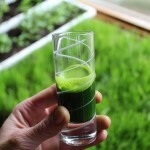 We will firstly look at one of the beauty benefits of consuming wheatgrass, and its power in the reversal of grey hair. So how exactly is this possible? Well according to Traditional Chinese medicine, our hair pigmentation is defined by the quality of our blood and the condition and strength of our kidneys. With this theory, if you have gone grey, it potentially means your kidneys and blood need to be strengthened. A number of foods can help do this, but not as effectively as wheatgrass due to its super high chlorophyll levels. Wheatgrass is the term used for young grass of the wheat plant (Tricum austivum). By juicing or drying its leaves into powder form for human consumption it can be one of nature’s most powerful super foods. It is most commonly available in juice bars and smoothie restaurants across the world, and can either be mixed with other fruit and vegetables or taken just on its own. (Doesn’t taste particular nice on its own). Ann Wigmore who wrote the now famous “The wheatgrass book” claims that by consuming wheatgrass juice on a daily basis you can slow down the aging process. Her claims aren’t without backing, as research indicates wheatgrass cleanses the blood, helps rejuvenate aging cells and can help tighten loose and sagging skin. Apart from the previously mentioned age reversing effects of Wheatgrass, This super nutrient also goes way beyond with capabilities of helping fight cancer, detoxifying our bodies and cleansing the liver. Due to the large amount of chlorophyll found in wheatgrass as well as vitamins, amino acids, minerals and enzymes, wheatgrass is able to provide the following benefits when consumed on a daily basis. A Powerful Detoxifier – Wheatgrass can help protect the liver and blood; it is able to neutralize toxic substances within the body such as cadmium, strontium, nicotine, mercury and polyvinyl chloride. Ability to help fight tumours – Over the years certain studies have suggested that wheatgrass juice has the ability to help fight tumours without the normal toxicity of common drugs. Wheatgrass is a Blood Builder – The chlorophyll in wheatgrass has a similarity to haemoglobin, the compounds that carries oxygen in the blood. When the body absorbs chlorophyll, it is turned into blood, which transports nutrients to every cell in our bodies. Over the years many health practitioners have claimed that you may be able to double your red blood cell count by soaking in chlorophyll. One renowned nutritionist Dr. Bernard Jensen has found that wheatgrass and other green juices are the best blood builders. He states in his book “Health magic through chlorophyll from living plant life” that in several cases he was able to double the red blood cell count by having patients soak in a bath filled with chlorophyll –water. 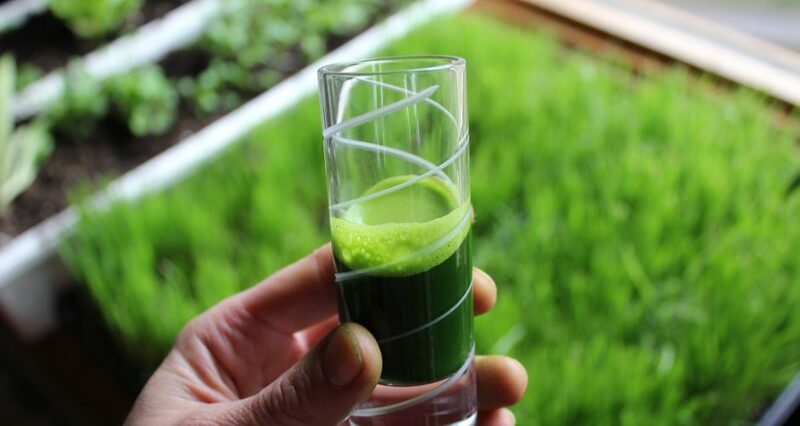 Further rapid blood building is reported to occur when patients consume wheatgrass juice and other juices rich in chlorophyll on a regular basis. Consumers who use wheatgrass for therapeutic purposes can grow wheatgrass and then extract the juice using a wheatgrass juicer. You can also for convenience buy wheatgrass in powder form which can be instantly mixed with water and consumed quickly. It’s most common to consume 1-3 table spoons of wheatgrass per day. Please Share this article with your friends and family and help spread the word about the power of wheatgrass.